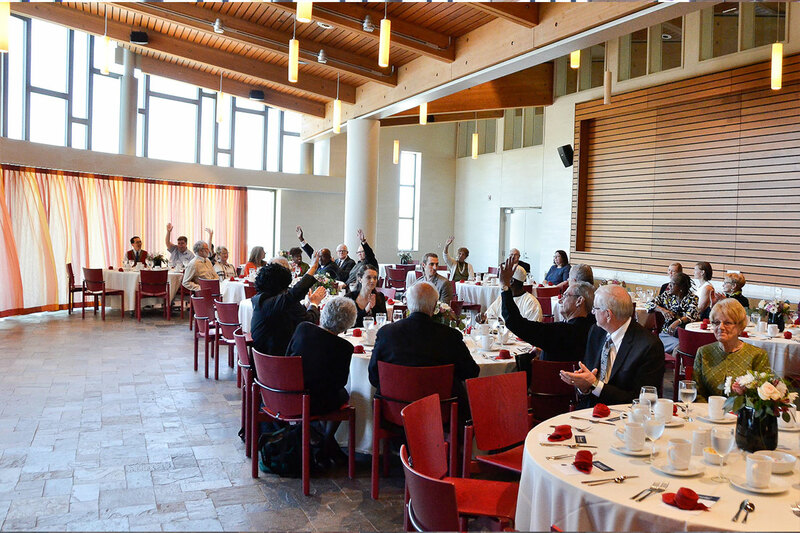 Plan your next off-site meeting, conference, retreat or reception at Chicago Theological Seminary. It’s a sleek, modern facility located in the Hyde Park, Woodlawn and University of Chicago neighborhoods. We offer meeting rooms, conference halls and reception areas of all sizes, each equipped with the latest technology and support. And it’s all extremely affordable. For more information, call 773.896.2429 or fill out this form and Roxie Kooi or Shauna Warren will get back to you shortly. These small rooms are ideal for group meetings and private discussions. Adjacent to larger classrooms, the rooms provide space to “break out” into smaller group sessions. They seat 2 to 10 people and can be reserved alone or with any of our classrooms. As the name implies, these airy rooms are designed for teaching classes. Equipped with a whiteboard, smartboards and video technology, they are great for lectures, presentations and large scale meetings. Our classrooms can accommodate from 20 to 40 individuals. For larger meetings, academic lectures or corporate off-site events, we also have two large classrooms. These have stadium-like seating with room capacity for 45 to 75 individuals. Each of these rooms is wheelchair accessible. These sleek, state-of-the art rooms are designed for larger meetings and conferences. With seating for 16 to 20 around a large central table and a ledge for coffee service inside the room, these spaces are perfect for conference calls, board meetings or all-day brainstorming sessions. This is one of CTS’s iconic spaces. It’s a quaint little chapel, nestled inside a double-sided wall of free-flowing water. 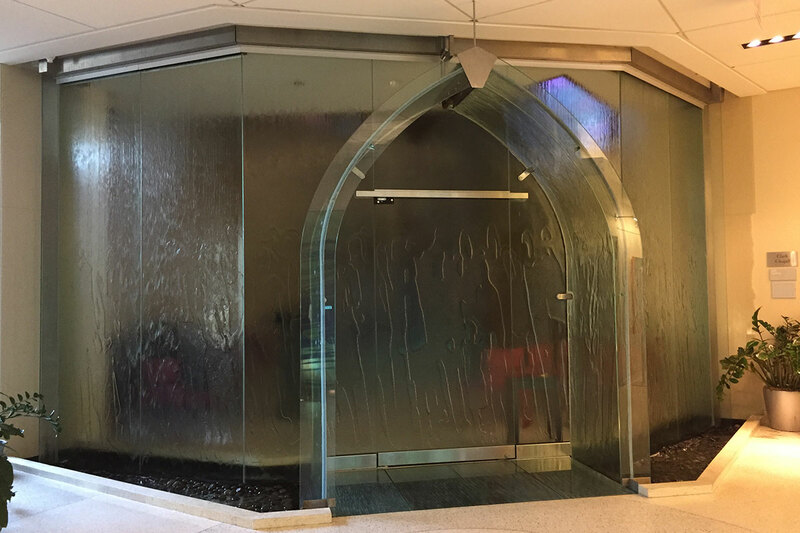 This water-encased glass chapel can hold up to 40 people with flexible seating arrangements. It’s perfect for intimate life events including: baptisms, commitment ceremonies, receptions and other gatherings. Whatever room and event you host at CTS, there is a great dining hall to feed your guests. 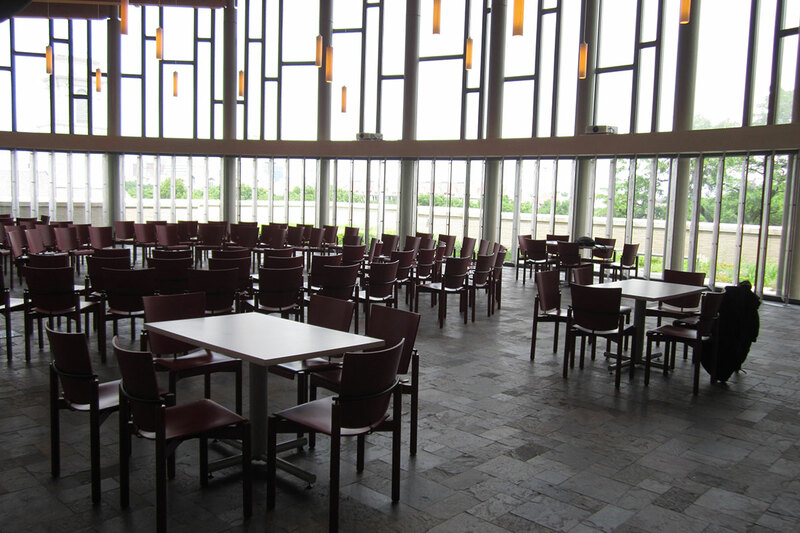 Adjacent to the Skyline Chapel, this large banquet area can accommodate and feed up to 150 people with flexible seating arrangements. It’s perfect for large business lunches, galas, parties, or any type of reception. The hall’s professional kitchen provides plenty of space for staging and storing catered events. The showcase venue at CTS, this top floor space is an airy loft with high ceilings and stunning views of downtown Chicago. 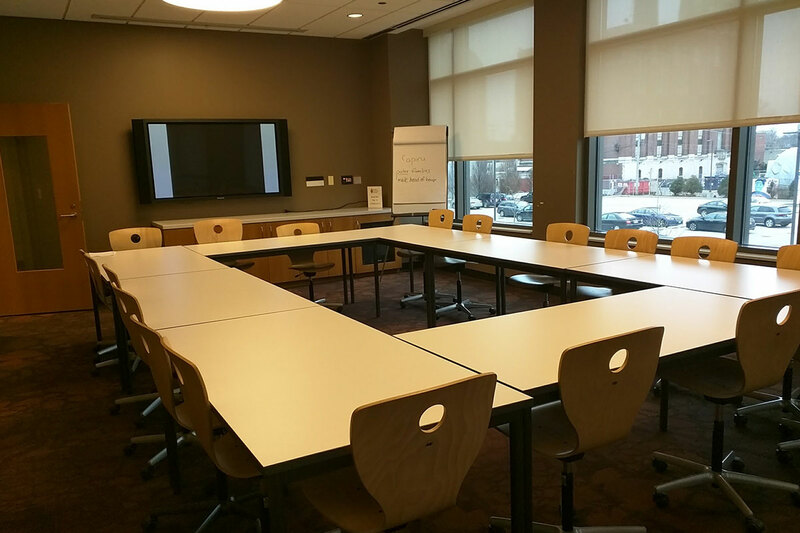 Situated on the fourth floor, it provides flexible seating arrangements for up to 225 people. There is even an outdoor “green roof patio,” where you can stroll, take photos and take in the neighborhoods of Hyde Park, historic Woodlawn, as well as the University of Chicago. 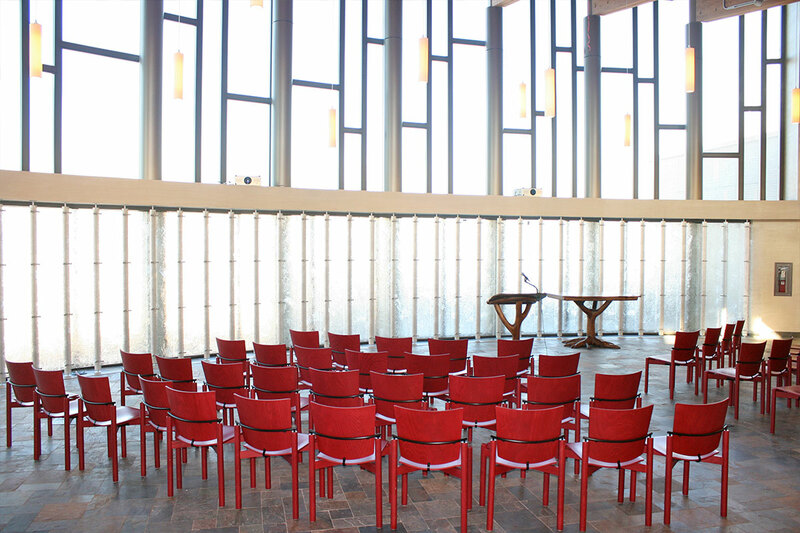 This large chapel is completely equipped with the latest technology, making it perfect for large board or investor meetings, conferences, public lectures, large seminars, memorial services and other private events. CTS has a small parking lot right behind the building that is available outside of business hours. There is also a free parking lot a block away. Plus, there is always plenty of free parking on the streets right in front of the building. The LEED Gold certified building has central air conditioning and heat throughout. CTS is a fully handicap compliant building, including our parking and elevators. We also provide audio-assistance for the hearing impaired. Throughout the building, we offer furnishings for your big event. From tables and chairs, staging, risers, lecterns, even a piano. Our facility offers a wide range of a/v rentals including an array of microphones (wireless, handheld, lapel, etc. ), recording devices, CD and Blu-Ray players, projectors and screens, and a house sound system. There is WiFi throughout the building as well as other internet equipment like ethernet cords. We maintain a high quality list of preferred catering vendors who know our building well. Our full kitchen can be used for staging and storage purposes only. If a client chooses to employ a caterer not on our preferred list, we will assess a surcharge equal to 10% of the base room rental. On the ground floor, there is a small garden grotto that is ideal for photos. Our top floor offers a green rooftop patio with stunning views of downtown Chicago and other neighborhoods. Oh, and it's completely sustainable and eco-friendly, too. Please come and check out the venue for yourself! We offer walk through tours Monday through Friday from 8:30 am to 4:30 pm, by appointment only. To schedule a tour, please contact our Event & Reception Specialist, Roxie Kooi at reservations@ctschicago.edu or call 773.896.2429. To inquire more information or to check space availability, please fill out the form below. We require a deposit equal to 50% of the total rental amount at the time of contract signature. More than 30 Days: CTS will retain 50% of deposit, and refund all other monies paid. 30 Days to 7 Days: CTS will retain 100% of deposit, and refund all other monies paid. 7 Days or Less: Renter is responsible for paying full cost as detailed in this Agreement. CTS reserves the right to cancel all or part of the agreement if deposit(s) or full payment is not received by the date(s) and amount(s) indicated herein.